I think this technique is brilliant. Karen’s blog is a must see. Beatiful paintings and wonderful digital techniques can be found there. This effect can be used on any finished painting or your work in progress. For the rest of the story click on the link below. It is an easy and effective technique. Update: You no longer need the Hot Fix, Sp-1 has now been released for the Mac and PC. It is the only update you currently need and you can find both here. I was browsing the Core Painter 12 Site and noticed that there is a hot fix for Mac OS X 10.7. I just wanted to let my MAC user friends know; I’m not sure how long the fix has been out. I don’t see a patch or hot fix for the PC, yet. I was in Karen Bonaker’s Paint with Me class recently and was working in watercolor. Frequently, I will mix watercolor and digital watercolor variants to get the look I want. I guess I never noticed this before, or never tried it with watercolor, but the Pickup Underlying Colors option was active in the layers panel. And when I began to paint with a digital watercolor variant over the watercolor layer, it picked up the colors and began to blend them. I know what most of you are thinking. He never tried Pickup Underlying Colors before, right? Well, I have; I use it all the time with other media, but for some reason I had not used it with watercolor. “I am to real! We established that with Uncle Tim. I am a good virus like Glenda the good witch in the Wizard of Oz,” he screeched. I turned back to my computer and began typing, but I guess you know that. Sometimes I get confused and wonder who I am talking with, the imaginary virus or the imaginary folks who may be reading the blog. But I digress. So I was in Karen’s class, and I started applying paint using my Splashing Water > Digital Sq Pool Blender and was shocked to see very rich colors and some cool blending happening. As you would expect, color from the previous layers added to the richness of the current layer colors. To demonstrate, I didn’t know which would be better, a painting or a video. I decided a video, but in the video, I mentioned that I hadn’t used the technique in a painting, which is only partially true. There was the painting in Karen’s class, but I haven’t actually finished the painting. That means I haven’t actually used it in a painting, right? To continue: I then decided it would be fun to use the Kaleidoscope Painting tool and make a finished example, which I did. However, even though I used the blending technique, it doesn’t show very well. I lost myself in the pretty colors. 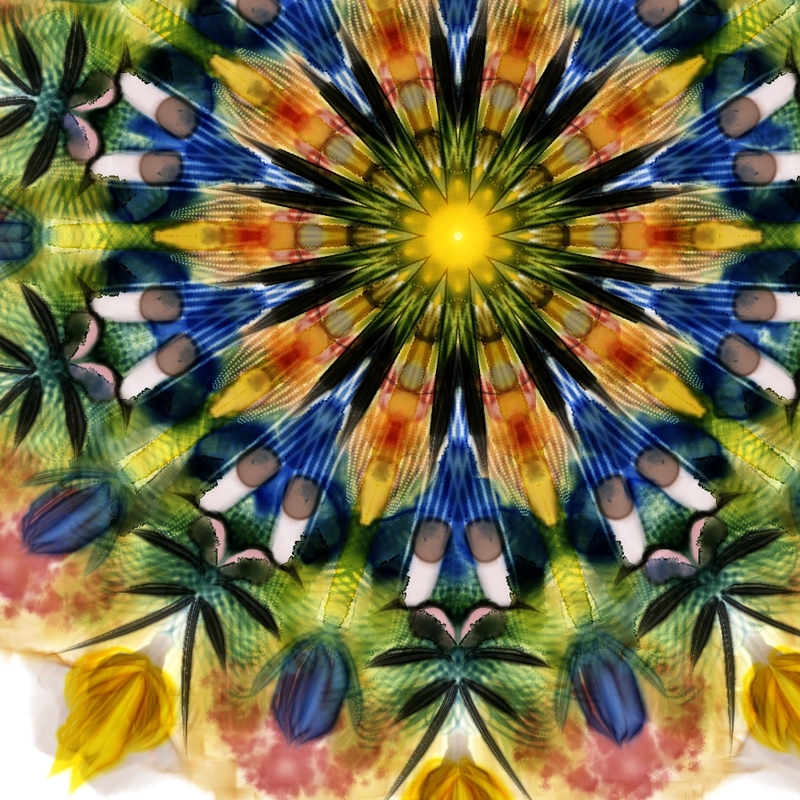 That Kaleidoscope Painting tool is addictive. It is hypnotic. I know it can be used to make beautiful paintings; one of my students used it to make an umbrella being held by a bathing beauty. It was terrific and very creative. I was just playing for the sake of playing. Hey, I’m retired, I can do that. Next is the image I made and following that will be the video tip. I hope you enjoy them. Don’t be afraid to leave comments. 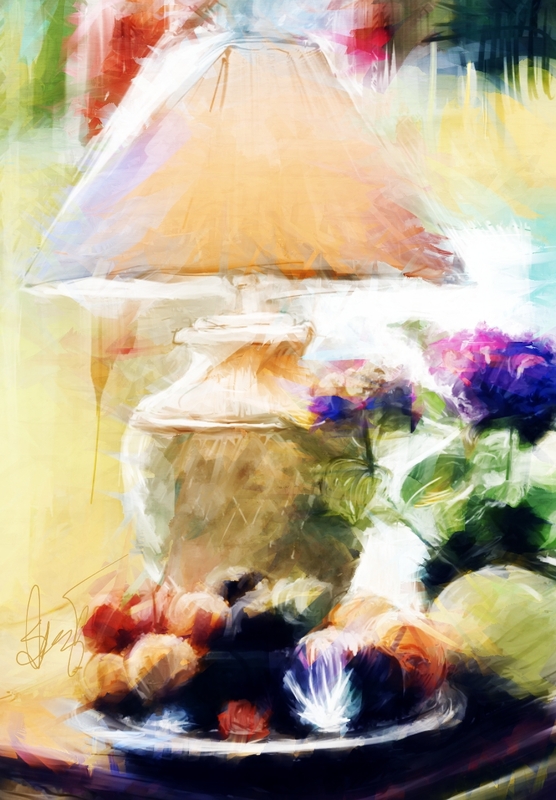 Painted in Painter 12 with Real Watercolor variants and Digital Watercolor variants. Next is the quick tip video. That’s it for this post. I am getting a fair number of hits these days and I really appreciate the visitors. Stop by often. Offset Sampling – Two videos from my Painter 12 Class. The first session of my class, Painter 12, A New Beginning, just ended and registration for the second session is now open at the Digital Art Academy. Click on Registration Page to register. The second session begins August 27, 2011 and ends September 23, 2011. I hope to see a you there. As a teaser, I am adding two more videos from the class. The subject is Offset Sampling, which has been added to the Clone Source Panel. It offers some unique ways to clone, and also can mimic the way you cloned in Painter 11. I created most of this image during the videos, but added later. “It’s not nice to tease,” Kevin comments. “A very good virus; not a bad virus. I’m like Glenda from the Wizard of Oz. She is a good witch; not a bad witch. I told you that already,” he corrected. Sorry for the interruption. In the following two videos, you will see how to clone with offset sampling. The above image wasn’t completed during the videos. I didn’t do much more, but later I will explain the few things that I did to arrive at the final piece. These videos come from week four of the class, so you may think I am going over stuff pretty quickly, but remember we have already covered a great deal up to this point and I can up the pace for the students. I hope you enjoy the videos. BTW, I had a little static in a couple of places. I’m not sure where it is coming from; I probably bumped the microphone or something similar. After finishing the videos, I decided to do a little more to the image, which consisted of duplicating the top layer 3 times and playing with the composite method of each layer. The other layers that were made, also had composite method changes and I tweaked the opacity slider a bit more. And that was it. I do enjoy working with offset sampling; I think it is a power but underused tool for Painter. Well, that’s it for this post. If you have questions of comments, please do make them. I have been so busy with my class I haven’t had time to add anything to my blog. 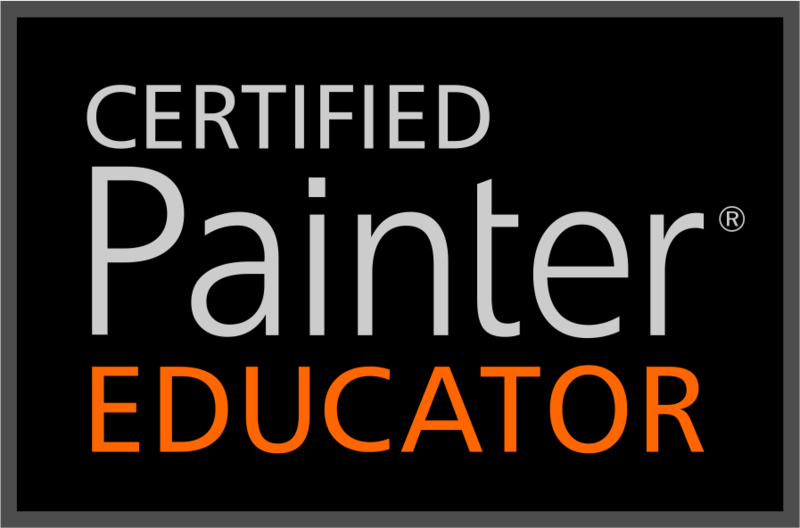 It occurred to me that I could add one or two of the videos I created for the Painter 12 Class. I guess I could call it a preview or sample from the class. There are about 30 class videos, so showing one or two will not give away the plot. There are so many new and enhanced features it takes that many videos to cover everything. “Oh Kevin, I am so sorry,” I said holding in a small chuckle, but not well enough. “Now you are laughing at me. I may tell every little dirty secret I know about you! I really should,” he shouted. Wow, Kevin isn’t usually this emotional; yes he throws barbs at me, but this time he seems genuinely hurt. Kevin is a nice enough guy, and I have known him all my life. Sometimes, though, he can be so clingy. If anyone wants to strike up a conversation with Kevin, feel free…I’m sure you will be happy that you did. Following is the video from Week 1 of the class. We are in the third week and the final and fourth week starts Saturday. If you enjoy the music by Michael Moore-Kelly, do check out his album, “Piano Without Makeup” at Amazon.com. Well that’s it for this post. I hope you enjoy the video and if you are looking for a place to learn the new stuff in Painter 12, consider my class at Digital Art Academy. Registration starts Saturday.